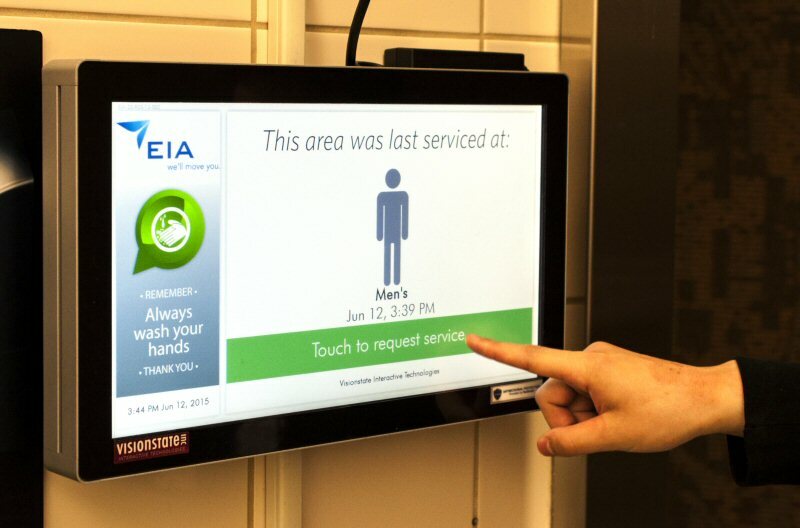 Restrooms at Edmonton International Airport (EIA) are a lot smarter with new restroom technology. Visionstate Inc., a division of Visionstate Corp. (TSX VENTURE:VIS), will be installing WANDA devices in 5 restrooms at the airport. The technology is designed to enhance the guest experience of passengers landing in Edmonton by optimizing cleaning services. Passenger traffic last year was a record 8.2 million for the popular hub, making cleaning restrooms a complex task. With this significant amount of travelers and being the largest airport by area in Canada, EIA has to offer the best guest experience, and WANDA is the latest technology for this. "We are always looking for ways to give travellers a better experience at EIA, and as we grow, technology like WANDA will be essential," says Steve Maybee, EIA Vice President of Operations. What is WANDA (Washroom Attendant Notification Digital Aid)? 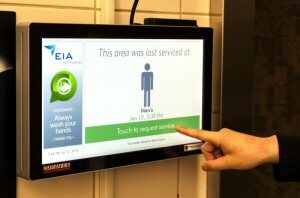 WANDA is a smart device, mounted on a wall near the restroom, which allows guests to request service, staff to log in to respond quickly and record service, and management to collect data to better optimize cleanings. A surprising amount of data can be collected from restroom services, which WANDA will take and report to management. The Analytics dashboard outlines cleaning trends, guest concerns, resources used, scheduling issues, and more. This will allow EIA to provide the best cleaning service in the restroom. The restroom is many passengers' first stop when entering an airport and is a great opportunity to leave a positive impression. WANDA will improve resource management and employee accountability, resulting in a cleaner restroom. Travelers will also have a voice in an unclean facility. With the touch of a few buttons, WANDA will email management and dispatch an employee to resolve an issue right away, leaving the restroom clean more frequently and leaving passengers feeling satisfied with customer service. Research Study: Alongside this installation Visionstate Inc. will be conducting a research study to determine the perceptual effects of the new technology on the travelers at EIA. Visionstate Inc., a division of Visionstate Corp. (TSX VENTURE:VIS) is the leader in interactive technology software that connects the world with enhanced guest services. Since its first installation in 2005, Visionstate has grown to see its software in buildings throughout Canada and the United States. By engaging customers throughout a facility, from touchscreen directories to mobile applications to cleaning management software, Visionstate adds to a building's experience with its original interactive solutions. More information can be found at www.Visionstate.com. About this company Visionstate Corp.